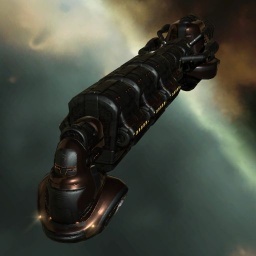 The Occator is the Gallente Deep Space Transport. Due to its tank and warp strength bonuses, it's a difficult ship to suicide gank in hisec. It has a fairly small cargohold, but instead has a 50,000 m³ Fleet Hangar, which can carry anything including assembled ships. The Fleet Hangar size is increased by the Transport Ships skill to 62,500 m³ (at level 5). Notably, Transport Ships IV gives 60,000 m³ and allows for transporting 3 packaged industrial ships, 4 battlecruisers or 6 cruisers (at 20,000 m³, 15,000 m³ or 10,000 m³ per hull respectively). The Occator can also fit a Medium Micro Jump Drive. Further information about additional or recommended skills to pilot Occator for a specific or it's common role(s) can be written here. No sub-article about Occator roles or piloting tactics. You can write them here. You can write additional notes for Occator here. This page was last modified on 31 December 2016, at 16:18. This page has been accessed 100,562 times.